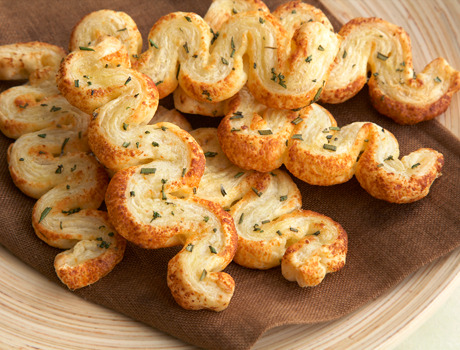 Elegant cocktail parties are not complete without these easy-to-make, delectable puff pastry ribbons. They're also a perfect way to dress up the menu at your next dinner party. Sprinkle a work surface with 2 tablespoons cheese. Unfold the pastry sheet on another the work surface. Brush the pastry sheet with water. Place the pastry sheet, wet-side down, onto the cheese. Brush the pastry sheet with water. Sprinkle with the remaining cheese and rosemary. Press the cheese mixture lightly into the surface of the pastry with a rolling pin. Cut the pastry sheet crosswise into 18 (1/2-inch) strips. Thread the pastry strips accordion-style on the skewers. Place the skewers onto 2 baking sheets. Bake for 15 minutes or until the pastries are golden brown. Let the pastries cool on wire racks for 2 minutes. Carefully remove the skewers from the pastries. Serving Suggestion: For a unique presentation, you can leave the pastries on the skewers and stand them in a pretty vase or glass. Make sure the edges of your Puff Pastry are cut—a folded edge will not rise and puff. 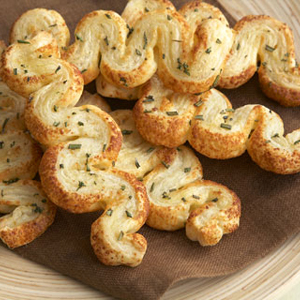 You can use a fluted ravioli cutter or cookie cutters to create decorative edges or shapes. To create circles, use a plate, bowl or water glass and trace with a knife. Once Puff Pastry is thawed, work quickly while it’s still cold. You can cut it into desired shapes, then store in the fridge until you’re ready for the next step.